NOW that we have given some study to Temperature Charts and the dates on which temperature variations should occur, Air Movement Charts and the dates on which wind variations should occur, and Moisture Charts, and the dates on which precipitation should occur, we are prepared to consider charts indicating not just ordinary variations, but unusual variations from the normal trend of the weather. These include wind storms, electrical storms, fogs, sandstorms, tornadoes, hurricanes, blizzards, cloudbursts and other uncommon conditions of the weather. In these studies, and those of more common weather conditions, we find that the outer-plane weather quite precisely mirrors the inner-plane weather during any particular period. But where this outer-plane weather will manifest pronouncedly depends upon the normal weather conditions of the areas of the world at that time of year, and the degree upon the Ascendants of the weather charts erected for given areas. We thus find that powerful aspects of any kind in the sky, and especially at those times when they are within the one effective degree of perfect that gives them the force of progressed aspects, always affect the weather in a corresponding manner on the earth. Invariably, discords in the sky bring disagreeable weather conditions on earth; and fine, harmonious aspects in the sky bring fine weather. However, even if the aspect is a trifle or sextile, if the planets are violent in their own nature, the weather also may be somewhat violent. When there is a heavy affliction from the electrical planet Uranus to other slow-moving planets, we may be sure that the sudden violence of Uranus, and its electrical force, will play a part in the weather at that time. Saturn is the general storm planet. Its heavy afflictions from other planets invariably produce destructive weather conditions. These may vary from drought to flood and from hail or a sandstorm to a winter blizzard. Just how Saturn will act is not easy to determine; except that its weather tends, as Saturn is the planet of loss and disappointment, to destroy crops and property. It is not the most violent of the planets, but about one-half the afflictions and loss experienced by mankind are mapped by its influence. And this general observation of its influence in the other branches of astrology is applicable also to the amount of destructive weather indicated by it. Neptune, when combined by destructive aspects with other heavy planets, gives weather of a rare type; fog, sandstorms, unusual objects falling with the rain, and the smog which now afflicts many present day cities. When violence is shown, if either Mars or Pluto is significant in the chart or by progressed aspect, the violence is increased. Heavy afflictions in the sky always bring weather afflictions on the earth; but the destructive weather may be a flood in China rather than in the United States, or it may be a drought in India, the freezing of crops in Siberia, or a typhoon in Japan. An indicated hurricane may take place far to the south of the United States. It is only when, by their house positions, the planets showing very heavy afflictions directly affect the given locality, as indicated by the weather charts erected at that place, that the indicated weather may be expected to have an influence at that place. And where storms of extreme magnitude are indicated, or other unusual weather conditions, nearly always, at least in some measure, the Temperature Chart, the Air Movement Chart, and the Moisture Chart for the period are all three involved. Therefore, storms and unusual weather should not be forecast as to time except after a careful study of all three weather charts for the given period. But when the Temperature Chart for the season shows violence at the particular place, and the Air Movement Chart shows violence at the particular place, and the Moisture Chart also shows violence at the particular place during the week it covered, one may be sure that within the area covered by the charts there is going to be destructive weather that week. And a study of the aspects formed to the Ascendants of the charts often will enable the exact day of the storm to be predicted. Now in order that we may, to best advantage, get some understanding of these violent aspects in the heavens which presignify storms and other unusual weather conditions, and how the planets are located by house position in the region where the unusual weather occurs, let us take events which are already on record, and analyze the weather charts which preceded them. The time for which these charts were erected is the Local Mean Time at the indicated place. In this study, and in the prediction of unusual weather, all three weather charts must always come in for consideration. The Temperature Chart for the season, of course, indicates the weather for the season. But when the storm occurs, there must also be indications of it in the Air Movement Chart or the Moisture Chart, or both. More commonly the indications are shown in all three charts, and in all cases where unusual weather conditions are predicted all three charts should come in for careful consideration; for all three have a bearing on such weather. To commence these studies, let us consider a quite local storm, just off the land at sea. It was, perhaps, no more violent, and was certainly less extensive, than numerous other storms in which there was no damage. This local storm is notorious, however, because the U. S. dirigible, Akron, the world’s mightiest airship at that time, had started on a short pleasure cruise, and was caught in the storm off Barnegat Light, New Jersey. The giant airship was torn apart and fell into the sea, a total loss of 5,000,000 dollars. And of the 76 men aboard, only three survived. To complicate the disaster still further, the U. S. Navy blimp, J-3, sent next morning to the rescue, also was forced down by the storm, and two of her crew of seven were drowned, bringing the total dead to 75. This chart was erected for March 20, 1933, 8:47 P.M., 74W. 39N45. This Temperature Chart preceding the Akron disaster is given in Serial Lesson 190 (Course XV, Chapter 1). Stormy Saturn is in the fourth house. Electrical Aquarius is on the cusp of the fourth, and its ruler, Uranus, is in violent Aries. This accounts for one-half of the influence of the chart. Violent Scorpio is on the cusp of the Ascendant, and one ruler, Mars, is in windy Virgo, while the other ruler, Pluto, is in wet Cancer. This accounts for one-fourth of the influence of the chart. Mars, ruling the sign occupied by the Sun, is in windy Virgo. This accounts for one-eighth of the influence of the chart. Of the three planets in angles, all three—Saturn, Neptune and Mars—are violent. This accounts for one-eighth of the influence of the chart. Thus did the season for Barnegat indicate violent storms, and on April 4 violent Mars made the sextile aspect to the Ascendant. This chart was erected for March 25, 1933, 4:46 P.M., 74W. 39N45. Its elements are given in Serial Lesson 194 (Course XV, Chapter 5). Violent Scorpio is on the cusp of the fourth house, and one of its rulers, Pluto, is in breezy Cancer, while the other, Mars, is in windy Virgo. This accounts for one-half of the influence of the chart. Violent Mars is in the first house. Quiet Leo is on the cusp of the first, but its ruler, the Sun, is in violent Aries. This accounts for one-fourth of the influence of the chart. Mars; the ruler of the sign occupied by Mercury, is in windy Virgo. This accounts for one-eighth of the influence of the chart. Mars in an angle is violent. This accounts for one-eighth of the influence of the chart. This chart certainly indicates much wind, and as Pluto is within the one effective degree of progressed square electrical Uranus, electrical disturbances are indicated. On April 4, Venus made the trine of the Ascendant, and windy Mercury came sesquisquare the Ascendant. This chart was erected for April 3,1933. 1:00 P.M., 74W. 39N45. Its elements are given in Serial Lesson 194 (Course XV, Chapter 5). Dry but violent Aries is on the cusp of the fourth, and its ruler, Mars, is in dry but windy Virgo. This accounts for one-half of the influence of the chart. Stormy Capricorn is on the cusp of the first, and its ruler, Saturn, is in electrical Aquarius. This accounts for one-fourth of the influence of the chart. Cancer, the sign occupied by the Moon, is very wet. This accounts for one-eighth of the influence of the chart. Of the planets in angles the Moon is wet, and because of its close square to electrical Uranus, Pluto is violent. This accounts for one-eighth of the influence of the chart. On April 3 the Moon made the conjunction of Pluto in the seventh, and the square of Uranus, and then on April 4 it moved to the inconjunct of the Ascendant. This, together with the aspect of violent Mars to the Asc. of the Temperature Chart, and the aspect of Venus and windy Mercury to the Asc. of the Air Movement chart, released the weather indicated by electrical Uranus within progressed square of violent Pluto. Usually even more local in extent, and more violent in both lightning and the downpour of rain, are cloudbursts. 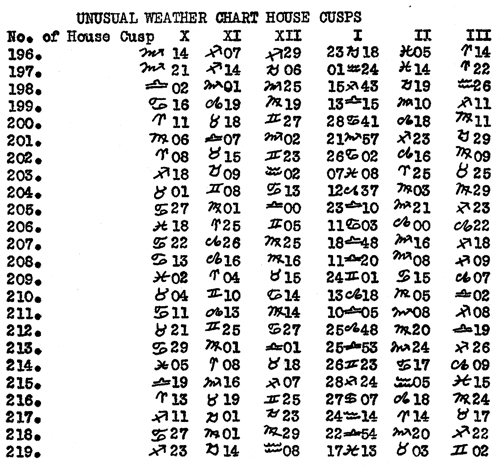 Already, in Course XV, Chapter 5 (Serial Lesson 194), “Astrological Moisture Charts,” Moisture Chart No. 186, I have mentioned one example of a cloudburst which occurred about 100 miles north of Los Angeles. But another from a different locality is here warranted. This chart was erected for June 21, 1930, 8:47 P.M., Peña Blanca, New Mexico. Its elements are given below. Violent Mars is in the fourth house. Calm Taurus is on the cusp of the fourth, and Venus, its ruler, is in calm Leo. This accounts for one-half of the influence of the chart. Stormy Capricorn is on the cusp of the first house, and Saturn, its ruler, is in stormy Capricorn. Aquarius is intercepted in the first, and its ruler, Uranus, is in violent Aries. Saturn is square the Sun. Saturn is opposition Pluto, and violent Uranus makes a T-square with this opposition. This not only accounts for one-fourth of the influence of the chart, but shows there is much violence in the sky. The Moon, ruling the sign occupied by the Sun, is wet. This accounts for one-eighth of the influence of the chart. Of the planets in angles, Mars and Neptune tend to violence, while Venus tends to moderate the weather. This accounts for one-eighth of the influence of the chart. This chart, the elements for which are given below, was erected for July 18, 1930, 7:30 P.M., Peña Blanca, New Mexico. Violent Mars is in the fourth closely square violent Neptune and closely sextile windy Mercury. Calm Taurus is on the cusp of the fourth, but its ruler, Venus, is in windy Virgo, closely conjunction violent Neptune and closely square violent Mars. This accounts for one-half of the influence of the chart. Electrical Aquarius is on the cusp of the first house, and its ruler, Uranus, is in violent Aries, square Pluto, square Sun, and square Saturn. This accounts for one-fourth of the influence of the chart. The Sun, ruling the sign occupied by Mercury, is in breezy and wet Cancer, conjunction violent Pluto. This accounts for one-eighth of the influence of the chart. Of the planets in angles, Mercury is windy, Venus is mild, and Mars and Neptune are violent. This accounts for one-eighth of the influence of the chart. This chart, the elements for which are given below, was erected July 18, 1930, 4:23 P.M., Peña Blanca, New Mexico. The planet of lightning, Uranus, is in the fourth house, square violent Pluto. Violent Aries is on the cusp of the fourth, and its ruler, Mars, is in windy Gemini, closely square violent Neptune. This accounts for one-half of the influence of the chart. The storm planet Saturn is in the first house, opposition Jupiter. Dry Sagittarius is on the cusp of the first, but its ruler, Jupiter, is in wet Cancer. This accounts for one-fourth of the influence of the chart. Mars, ruling the sign occupied by the Moon, is in dry but windy Gemini, closely square Venus and closely square violent Neptune. This accounts for one-eighth of the influence of the chart. Of the planets in angles, Saturn is stormy, the Moon is wet, Jupiter tends to fine weather, and Uranus tends to lightning and violence. Of special significance in releasing the violent weather indicated, is progressed Uranus trine the Ascendant throughout the duration of the influence of the chart. As a cloudburst lasts only a short time, perhaps less than an hour, and usually is confined to a region less than a mile square, where rain falls in torrents, the chart for the region is not necessarily wet; for most of the region covered by the chart may be dry. But a cloudburst always shows extreme violence. However, as the violence is due chiefly to water, we look chiefly to the Moisture Chart to time the date when it will occur. This one at Peña Blanca, New Mexico occurred July 24, 1930, when Mars was parallel the Asc. of the Temperature Chart, Mercury was parallel the Asc. of the Air Movement Chart, and Uranus was trine and the Sun made the sesquisquare to the Asc. of the Moisture chart. The cloudburst that resulted caused $10,000 damage, demolishing 12 homes and covering the land on which people had raised crops with sand. Of course, cloudbursts occur only in certain sections of the world, and a similar chart in another region would indicate violence of a different kind arising from the weather. In direct contrast to such violent precipitations are droughts, such as the one experienced throughout the month of June, 1933, in the Midwest. This chart was erected for March 20, 1933, 7:16 P.M., Sioux Falls, South Dakota. Its elements are given below. It was erected for this place because this was the hardest hit of all the drought area, which extended over Kansas, Nebraska, Minnesota, Iowa, Illinois, Missouri, Oklahoma, and North and South Dakota. Not only was the wheat crop badly burned, but the corn crop also was severely damaged. Both Saturn and the Moon in the fourth indicate rain, but Saturn tends to intensify any destructive condition of the weather, even droughts. Capricorn on the cusp of the fourth is stormy, but its ruler, Saturn, is in the dry sign Aquarius. This accounts for one-half of the influence of the chart. Dry Libra is on the cusp of the first, and its ruler, Venus, is in wet Pisces. This accounts for one-fourth of the influence of the chart. Mars, ruling the sign occupied by the Sun, is in dry Virgo. This accounts for one-eighth of the influence of the chart. Violent Pluto in the tenth house makes a progressed square to violent Uranus in the seventh house. Pluto is damp, but Uranus is dry. Moon and Saturn in the fourth tend to wetness, but Saturn was in progressed trine with the Asc. It is the storm planet, and in addition to the drought, there were many bad storms during the season. These angular planets account for one-eighth of the influence of the chart. This chart, the elements of which are given below, was erected for June 8, 1933, 7:34 A.M., Sioux Falls, South Dakota. Dry Libra is on the cusp of the fourth, and its ruler is in wet Cancer. Libra is windy, and Cancer is breezy. This accounts for one-half of the influence of the chart. Wet and breezy Cancer is on the cusp of the first, and the Moon, its ruler, is in dry and breezy Sagittarius. This accounts for one-fourth of the influence of the chart. The Moon, ruler of the sign occupied by Mercury, is in dry and breezy Sagittarius. This accounts for one-eighth of the influence of the chart. Saturn in an angle, the seventh house, is in dry and breezy Aquarius. This accounts for one-eighth of the influence of the chart. This chart, the elements of which are given below, was erected for June 14, 1933, 5:00 P.M., Sioux Falls, South Dakota. It does not, of course, represent the whole month of June, but only one week of it. This week, however, was the most severe period of the drought, and by the end of this week slight showers began to relieve the dryness in some sections. The wet Moon is in the fourth house, opposition dry Mars and Jupiter in the tenth, and trine damp but extreme Pluto. 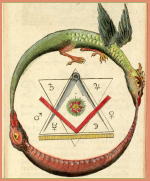 Wet Pisces is on the cusp of the fourth, but its ruler, Neptune, is in dry Virgo, (the sign ruling grain). This accounts for one-half of the influence of the chart. Extreme Scorpio is on the cusp of the first house. One of its rulers, Mars, is in dry Virgo, while its other ruler, Pluto, is in wet Cancer. This accounts for one-fourth of the influence of the chart. Neptune, ruling the sign the Moon occupies, is in dry Virgo. This accounts for one-eighth of the influence of the chart. Of the planets in angles, Moon is wet, Neptune is moist, and Mars and Jupiter are both dry. This accounts for one-eighth of the influence of the chart. However, Pluto, which increases the extreme tendency of a chart, whatever that tendency is, is in progressed trine with the Asc., and is square Uranus. Dry Mars and Jupiter, as well as unusual Neptune are in the sign of grain, Virgo, opposition the Moon. It would seem that progressed Pluto trine the Asc. in the Moisture chart, progressed Saturn trine the Asc. in the Temperature Chart, and progressed Jupiter semisquare Asc. in the Air Movement chart, enabled the heavy afflictions of the period to work out in terms of a drought which destroyed grain. Aspects within one degree of perfect to the Ascendant always have a powerful influence on the weather. By way of still further contrast, instead of the heat and dryness of a drought, let us consider one of the cold spells, two or three of which usually occur each winter and cause death and much suffering. This chart was erected for September 23, 1932, 0:24 A.M., Chicago, Ill. Its elements are given below. Cool Libra is on the cusp of the fourth, but its ruler, Venus, is in hot Leo. This accounts for one-half of the influence of the chart. Hot Mars is in the first house, but cold Cancer is on the cusp of the first, and its ruler, the Moon, is in cold Cancer. Furthermore, while not making progressed aspects to the Asc., Pluto is conjunction the Asc., Saturn is opposition both Pluto and the Asc., and cold and extreme Uranus, from an angle is making a T-square to both of these oppositions. This accounts for one-fourth of the influence of the chart, plus the influence of the indicated aspects. Venus, ruling the sign occupied by the Sun, is in hot Leo. This accounts for one-eighth of the influence of the chart. Of the planets in angles, Mars is hot, Venus moderates, Uranus is cold, and Saturn is cold. This accounts for one-eighth of the influence of the chart. 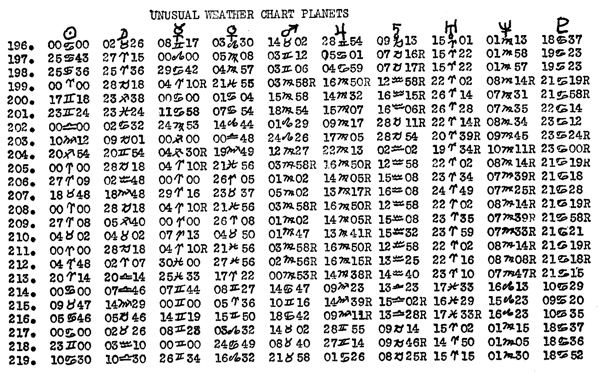 The significant thing about this chart is not that it indicates a cold season, but that the T-square from heavy planets, which include the Asc., indicate extreme weather at times which, as the T-square planets are cold, would tend to be cold. This chart was erected for November 2, 1932, 2:20 P.M., Chicago, Ill. Its elements are given below. Cold and windy Gemini is on the cusp of the fourth, and its ruler, Mercury, is in breezy and genial Sagittarius. This accounts for one-half of the influence of the chart. Cold and windy Uranus is in the first house square cold Saturn and cool Pluto. Cool Pisces is on the cusp of the first house, and its ruler, Neptune, is in cold and windy Virgo. This accounts for one-fourth of the influence of the chart. Jupiter, ruling the sign occupied by Mercury, is in cold and windy Virgo. This accounts for one-eighth of the influence of the chart. Of the planets in angles Neptune is cool, Jupiter is warm, and Uranus is cold and windy. This accounts for one-eighth of the influence of the chart. The T-square involving Uranus in the first indicates some periods of extremely windy and cold weather. This chart, the elements of which are given below, was erected for December 12, 1932, 8:30 P.M., Chicago, Ill.
Venus in the fourth is wet, and Mercury in the fourth is cold and dry. Scorpio, on the cusp of the fourth, tends to extremes. One of its rulers, Mars, is in cold Virgo, and the other, Pluto, is in cool Cancer. Virgo is dry and Cancer is wet. This accounts for one-half of the influence of the chart. 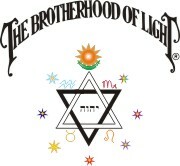 Leo, on the cusp of the first is hot, but the sign occupied by its ruler, the Sun, is extreme Scorpio. This accounts for one-fourth of the influence of the chart. Mercury, ruling the sign occupied by the Moon, is in dry and genial Sagittarius. This accounts for one-eighth of the influence of the chart. Moderate Venus and cold and windy Mercury are in an angle. This accounts for one-eighth of the influence of the chart. Dec. 12, 1932, violent Mars made the semisquare of the Asc. of the Temperature Chart, made the parallel of the Asc. of the Air Movement Chart, and made the semisextile of the Asc. of the Moisture Chart. This released the extreme weather indicated by each chart. Tornadoes and hurricanes receive special consideration in Chapter 7 (Serial Lesson 196), “Tornadoes and Hurricanes.” They are circular air movements. But there are also straight winds which have sufficient velocity to be highly destructive. Quoting from the newspaper: “Dayton, Ohio, May 9, 1933. A seventy mile an hour wind, accompanied by rain, hail and lightning, swept across southwestern Ohio today and caused damage estimated at $1,000,000. Ten persons were injured here, none seriously. “Hundreds of buildings were unroofed and power lines and trees blown down.” Dayton received the brunt of the storm. This chart, the elements of which are given below, was erected for March 20, 1933, 8:06 P.M., Dayton, Ohio. The Moon and the storm planet Saturn are in the fourth house. Capricorn is on the cusp of the fourth, and its ruler, Saturn, is in violent Aquarius. This accounts for one-half of the influence of the chart. Cold and windy Libra is on the cusp of the first, and its ruler, Venus, is in wet but calm Pisces. This accounts for one-fourth of the influence of the chart. Mars, ruling the sign occupied by the Sun, is in cold and windy Virgo. This accounts for one-eighth of the influence of the chart. Both the planets in angles, Moon and Saturn, are cold, and Saturn is stormy. This accounts for one-eighth of the influence of the chart. In addition to these factors, however, violent Neptune is in progressed semisquare to the windy Ascendant. This chart, the elements of which are given below, was erected for April 17, 1933, 9:37 A.M., Dayton, Ohio. Windy Virgo is on the cusp of the fourth, and its ruler, Mercury, is in violent Aries. This accounts for one-half of the influence of the chart. Violent Pluto is in the first house. Calm Cancer is on the cusp of the first, but the Moon, its ruler, is in violent Aquarius. This accounts for one-fourth of the influence of the chart. Mars, ruling the sign occupied by Mercury, is in windy Virgo. This accounts for one-eighth of the influence of the chart. Windy Mercury and violent and windy Uranus are in one angle, and violent Pluto in another angle is square Uranus. This accounts for one-eighth of the influence of the chart. This is a violent and windy chart. This chart, the elements of which are given below, was erected for May 9,1933, 4:27 P.M., Dayton, Ohio. Stormy Saturn is in the fourth house. Stormy Capricorn is on the cusp of the fourth, and its ruler, Saturn is in violent Aquarius. This accounts for one-half of the influence of the chart. Windy Libra is on the cusp of the first, and its ruler, Venus, is in calm but wet Taurus. This accounts for one-fourth of the influence of the chart. Pluto, one ruler of the sign occupied by the Moon, is in wet Cancer, and the other ruler, Mars, is in the dry and windy sign Virgo. This accounts for one-eighth of the influence of the chart. Of the planets in angles, Saturn is stormy, Pluto is drastic, Mercury is windy, and Uranus is windy and violent. This accounts for one-eighth of the influence of the chart. Mercury is conjunction Uranus, and both are square Pluto. May 9, when the storm broke, Venus was inconjunct the Asc. of the Temperature Chart, the Moon was parallel the Asc. of the Air Movement Chart, and the Sun was inconjunct the Asc. of the Moisture chart. Next let us consider a freak storm. Quoting from the newspaper: “Kansas City, April 29: Freakish weather—a shower of mud in Kansas, snow in normally temperate places, severe dust and sand storms and high winds that made going hazardous for pedestrians—was served up in various parts of the West today. This chart, the elements of which are given below, was erected for March 20, 1933, 7:03 P.M., Dodge City, Kansas. Stormy Saturn and the wet Moon are in the fourth house. Stormy Capricorn is on the cusp of the fourth, and its ruler, Saturn, is in violent Aquarius. This accounts for one-half of the influence of the chart. Cold and windy Libra is on the cusp of the first, and its ruler, Venus, is in wet Pisces. This accounts for one-fourth of the influence of the chart. Of the planets in angles, Uranus is violent, Saturn is stormy, and the Moon is wet. This accounts for one-eighth of the influence of the chart. This chart, the elements of which are given below, was erected for April 17, 1933, 8:34 A.M., Dodge City, Kansas. Pleasant Jupiter and violent Neptune are in the fourth. Windy Virgo is on the cusp of the fourth, and its ruler, Mercury, is in violent Aries. This accounts for one-half of the influence of the chart. Windy Gemini is on the cusp of the first, and its ruler, Mercury, is in violent Aries. This accounts for one-fourth of the influence of the chart. Mars, ruler of the sign occupied by Mercury, is in windy Virgo. This chart, the elements of which are given below, was erected for New Moon, April 24, 1933, at noon, Dodge City, Kansas. Scorpio on the fourth is a dirty sign, and gives wetness. One ruler, Mars, is in dry Virgo, and the other ruler, Pluto, is in wet Cancer, square violent Uranus in the tenth house. The New Moon is in wet Taurus conjunction Venus. Progressed Jupiter is semisextile the Asc. 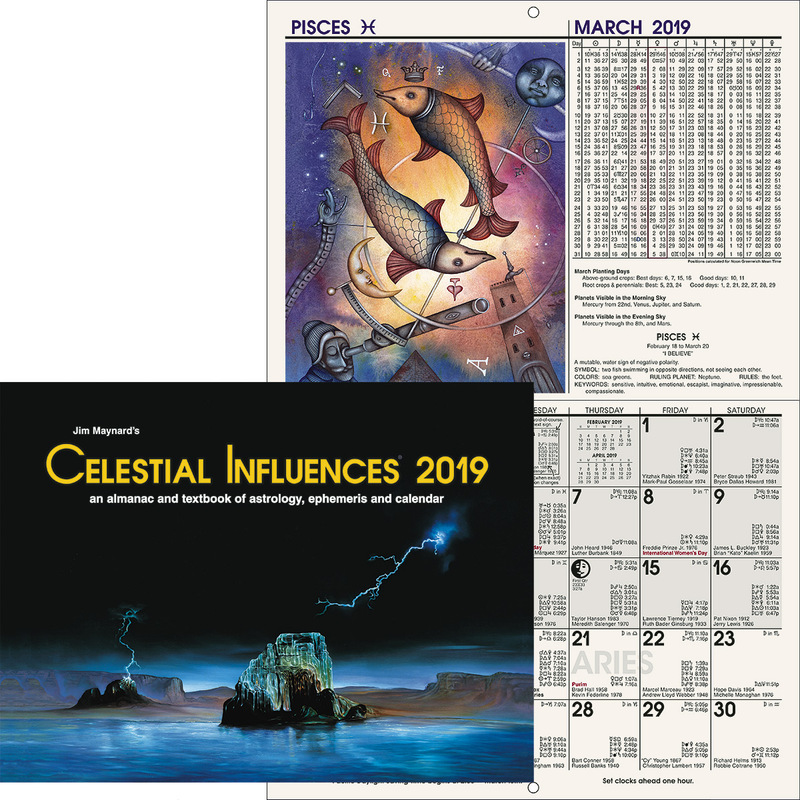 On April 29, 1933, the day of the mud storm, progressed Venus was inconjunct the Asc. of the Air Movement Chart, progressed Sun was semisquare the Asc. of the Air Movement Chart, and in addition to progressed Jupiter still being semisextile the Asc. of the Moisture chart, progressed Mercury was trine the Asc. of the Moisture chart. At Dodge City the wind element, which is shown to be markedly violent and unusual, was not so prominent, but it manifest fully elsewhere. As this mud storm was preceded by a sandstorm, let us now consider a sandstorm of such violence and length of duration that it occasioned not only inconvenience, but considerable damage. The worst sandstorm in the history of Texas occurred April 13, 1933, in the Panhandle. The wind blew 40 to 50 miles an hour, making automobile traffic impossible. The sand buried fences, and the air was so thick with it that seeing more than a few feet was impossible. There were at intervals also gusts of rain, snow and sleet. This chart, the elements of which are given below, was erected for March 20, 1933, 6:55 P.M., Panhandle, Texas. Moist Moon and stormy Saturn are in the fourth house. Again stormy Capricorn is on the cusp of the fourth, and its ruler, Saturn, is in violent Aquarius. This accounts for one-half of the influence of the chart. The Moon being opposition Pluto, and Uranus making a T-square to the opposition, increases the tendency to violence. Windy Libra is on the cusp of the first, and its ruler, Venus, is in cool but wet Pisces. This accounts for one-fourth of the influence of the chart. The Moon, ruling the sign occupied by the Sun, is in stormy Capricorn. This accounts for one-eighth of the influence of the chart. Of the planets in angles, Pluto and Uranus tend to violence, Saturn tends to cold and storm, and the Moon to rain or snow. This accounts for one-eighth of the influence of the chart. It is an ugly looking season chart. This chart, the elements of which are given below, was erected for March 25, 1933, 3:05 P.M., Panhandle, Texas. The violent sign Scorpio is on the cusp of the fourth, and one of its rulers, Mars, is in dry and windy Virgo, while the other ruler, Pluto, is in wet Cancer. This accounts for one-half of the influence of the chart. Violent Mars, and the planet which gives fog or sandstorms, Neptune, are conjunction in the first house. The more pleasant Jupiter is also in the first house, but all three are in the windy sign Virgo. The Sun, ruling the cusp of the first, is in violent Aries. This accounts for one-fourth of the influence of the chart. Neptune, ruler of the sign occupied by Mercury, is in cold and windy Virgo. This accounts for one-eighth of the influence of the chart. Of the planets in angles, Jupiter is mild, but Mars and Neptune are violent. This accounts for one-eighth of the influence of the chart. This chart, the elements of which are given below, was erected for Full Moon, April 10, 1933, 6:50 A.M., Panhandle, Texas. Stormy Saturn is in the fourth house. Here again stormy Capricorn is on the cusp of the fourth, and its ruler, Saturn, is in the violent sign Aquarius. This accounts for one-half of the influence of the chart. Windy Libra is on the cusp of the first house, and its ruler, Venus, is in violent Aries. This accounts for one-fourth of the influence of the chart. Venus, ruling the sign occupied by the Moon, is in violent Aries. This accounts for one-eighth of the influence of the chart. The two planets in angles, Mars and Saturn, are both violent. This accounts for one-eighth of the influence of the chart. Sun is conjunction Uranus, and both are square Pluto. April 13, when the sandstorm was at its peak—starting when Mercury came within the one degree of orb to the Air Movement Asc.—the Moon was sextile the Asc. of the Temperature Chart, Mercury was inconjunct the Asc. 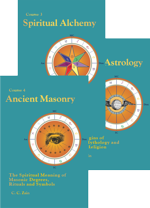 of the Air Movement Chart, and Mercury was inconjunct the Asc. of the Moisture Chart. When the Moon also made the semisquare of the Asc. of the Moisture Chart there was rain, snow and sleet. Another kind of weather which occasionally causes considerable damage is hailstorms. Such a storm of wind and hail, in which the damage done by the hail was estimated at $600,000, occurred June 29, 1923, at Dodge City, Kansas. This chart, the elements for which are given below, was erected for June 22, 1923, 4:23 A.M., Dodge City, Kansas. Windy Virgo is on the cusp of the fourth house, and its ruler, Mercury, is in cold and windy Gemini. This accounts for one-half of the influence of the chart. Violent Mars and violent Pluto are conjunction with the Sun and with each other in the first house. Cold and windy Gemini is on the cusp of the first, and its ruler, Mercury, is in cold and windy Gemini. This accounts for one-fourth of the influence of the chart. Mercury, ruling the sign occupied by Mercury, is in cold and windy Gemini. This accounts for one-eighth of the influence of the chart. The three planets in the first house, the three in angles, are predominantly violent. This accounts for one-eighth of the influence of the chart. But the fact that all three are also square Saturn, the planet of hail, should also be given consideration. This chart, the elements of which are given below, was erected for April 30, 1923, 10:39 P.M., Dodge City, Kansas. The Sun is in the fourth, but is opposition Moon and Jupiter and square Neptune, indicating violence. Violent Aries is on the cusp of the fourth, and its ruler, Mars, is in cold and windy Gemini. This accounts for one-half of the influence of the chart. Sagittarius is on the cusp of the first house, and its ruler, Jupiter, is in violent Scorpio. Capricorn, however, is intercepted in the first house, and its ruler, Saturn, is in windy Libra. This accounts for one-fourth of the influence of the chart. Mercury, ruler of the sign occupied by Mercury, is in cold and windy Gemini. This accounts for one-eighth of the influence of the chart. Pluto, Jupiter, Sun and Moon in the angles do not signify much wind for this one-eighth influence of the chart. However, the Sun in an angle is square violent Neptune. This chart, the elements of which are given below, was erected for June 29, 1923, 6:25 A.M., Dodge City, Kansas. Saturn, the storm planet and the planet of hail, is right on the cusp of the fourth house. Jupiter is also in the fourth, indicating some very pleasant weather. Windy Libra is on the cusp of the fourth, and its ruler, Venus, is in cold and windy Gemini. This accounts for one-half of the influence of the chart. Unusual Neptune is in the first house. Wet Cancer is on the cusp of the first, and its ruler, the Moon, is in cold and stormy Capricorn. This accounts for one-fourth of the influence of the chart. Saturn, the ruler of the sign occupied by the Moon, is in cold, dry and windy Libra. This accounts for one-eighth of the influence of the chart. Of the planets in angles, Jupiter is warm and sunny, Neptune gives peculiar weather, and Saturn gives storms. This accounts for one-eighth of the influence of the chart. On June 29, 1923, the date of the hailstorm, violent Mars was square the Asc. of the Temperature Chart, the Sun was parallel the Asc. of the Air Movement Chart, and Uranus was square the Asc. of the Moisture Chart. These were all progressed aspects within the one effective degree of orb. We need just one more type of weather fairly well to have covered unusual weather conditions, with the exception of tornadoes and hurricanes. So we will conclude this chapter with the three charts preceding an electrical storm. This electrical storm, on the evening of July 6, 1930, resulted in the destruction of a $28,000 clubhouse at Clarence, N. Y. 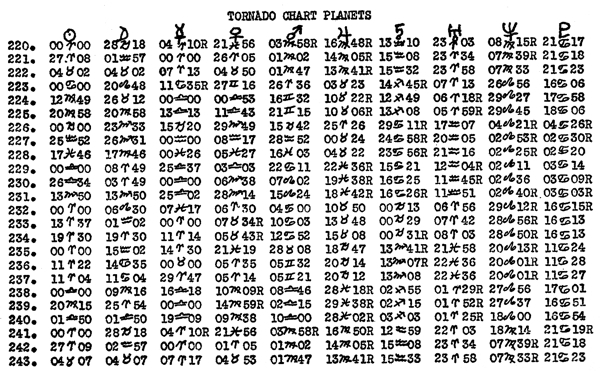 This chart, the elements of which are given below, was erected for June 21, 1930, 10:29 P.M., Clarence, N. Y.
Genial Jupiter and pleasant Sun are in the fourth house, but both are opposition Saturn, the planet of storms. Cold and windy Gemini is on the cusp of the fourth, and its ruler, Mercury, is in cold and windy Gemini. This accounts for one-half of the influence of the chart. Electrical Aquarius is on the cusp of the first, and its ruler, Uranus, is in violent Aries square violent Pluto. This accounts for one-fourth of the influence of the chart. The Moon, ruler of the sign occupied by the Sun, is in mild Taurus. This accounts for one-eighth of the influence of the chart. Of the planets in angles, Jupiter and Sun are pleasant, but Neptune is given to peculiar weather. This accounts for one-eighth of the influence of the chart. This chart, the elements of which are given below, was erected for June 14,1930, 2:29 P.M., Clarence, N. Y. The Moon is in the fourth in the electrical sign Aquarius, and is square violent Mars. Stormy Capricorn is on the cusp of the fourth, and its ruler, Saturn, is in stormy Capricorn. This accounts for one-half of the influence of the chart. Windy Libra is on the cusp of the first, and its ruler, Venus, is in mild Cancer. This accounts for one-fourth of the influence of the chart. Of the planets in angles, Moon tends to water and Mars to fire. Their square to each other tends to violence. This chart, the elements of which are given below, was erected for the first quarter of the Moon, July 2, 1930, 10:50 P.M., Clarence, N. Y.
Mercury and the Sun are in the fourth house, the Sun being opposition Saturn, square Uranus and conjunction Pluto. This is a very violent combination, and as Uranus is in an angle and involved, electricity would be featured in the storm indicated. Windy Gemini is on the cusp of the fourth, and its ruler, Mercury, is in windy Gemini. Uranus, the planet of lightning, is in the first house, opposition Saturn, and square Sun, Moon and Pluto. Wet Pisces is on the cusp of the first, and its ruler, Neptune, is in dry Virgo. Venus, ruling the sign occupied by the Moon, is in dry Leo. This accounts for one-eighth of the influence of the chart. Of the planets in angles, Mercury is windy, Sun is dry, and Uranus is electrical. July 6, when the lightning struck, progressed Mars was square the Asc. in the Temperature Chart, progressed Mars was inconjunct the Asc. of the Air Movement Chart, progressed electrical Uranus was parallel the Asc. of the Moisture Chart, and progressed Moon was trine the Asc. of the Moisture Chart.